Re-usable high tear and abrasion resistant Green PVC Cape / Jacket. Excellent chemical resistance against many acids and alkalis. More chemical protection stitched and high frequency welded seams for added protection. Proven chemical protection solution for over 30 years. Recommended applications include: Chemical site handling, Oil and Gas, Tank cleaning, Chemical cleaning and Petrochem refining. Chemical protection jacket includes 100% PVC gauntlets with a seamless 100% Polycotton liner. The seam between the PVC Cape/Jacket and the PVC Gauntlet has been “Air Leak” tested. 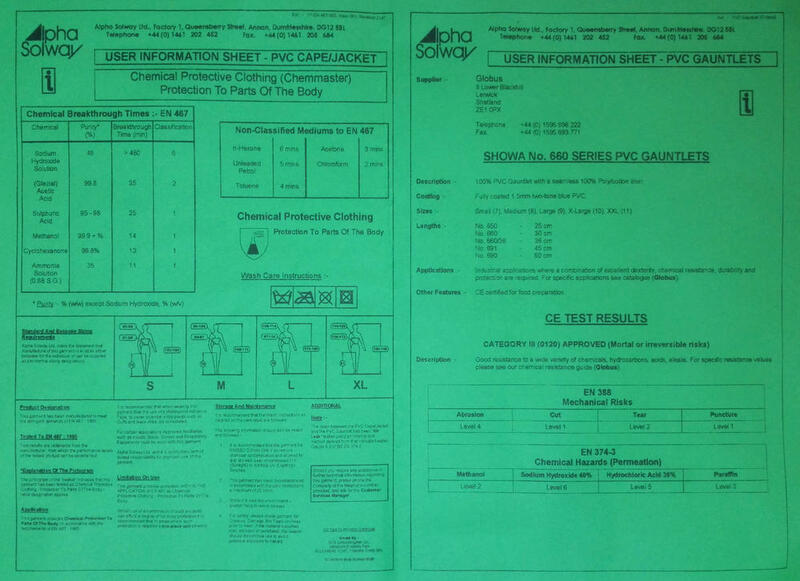 Showa 660 series gloves are CE certified for food preparation and tested to confirm EN 388 4.1.2.1 safety standards. PVC Cape/Jacket: 100% PVC Coated Nylon. PVC Cape/Jacket Conforms to: BS EN 467. PVC Gauntlets Conforms to: BS EN 388 and EN 374-3. The protection factor is indicated on a scale from 1 to 5 depending on how many revolutions are required to make a hole in the material. The higher the number, the better the glove. Based on the number of cycles required to cut through the sample at a constant speed. The protection factor is then indicated on a scale from 1 to 5. Based on the amount of force required to tear the sample glove. The protection factor is then indicated on a scale from 1 to 5. Based on the amount of force required to pierce the sample glove with a standard sized point. The protection factor is then indicated on a scale from 1 to 5. Tested and approved chemical gloves. Standard specifies the capability of gloves to protect the user against chemicals and/or micro-organisms. Performance requirements for garments, providing protection, against Liquid Chemicals to parts of the body. Waist Size 28" 30" 32" 34" 36" 38" 40" 42" 44" 46" 48" 50" 52"
Leg Length - Short 29" 29" 29" 29" 29" 29" 29" 29" 29" 29" 29" 29" 29"
Leg Length - Regular 31" 31" 31" 31" 31" 31" 31" 31" 31" 31" 31" 31" 31"
Leg Length - Tall 33" 33" 33" 33" 33" 33" 33" 33" 33" 33" 33" 33" 33"